The Norwegian state stands behind GIEK’s guarantees. There are procedures to draw on the state’s liquidity if accumulated capital in the individual guarantee insufficient. That makes a difference out in the world and levels the playing field for Norwegian companies competing abroad. What types of products and services do Garantiinstituttet for eksportkreditt (GIEK) offer in Norway? Here is a list of products provided by GIEK catering to a wide group of people such as the exporter, potential buyer, bank and investors. GIEK establishment dates to the 1920s with the establishment of the Russian commission. The Russia Commission was established under the Ministry of Trade, and the guarantee scheme thus became more permanent. In 1934, the scheme was expanded to cover all countries and renamed the Government Export Credit Commission. Apart from the Soviet Union, the largest insured export volumes went to Germany, Italy, Greece, Spain and Brazil. In the 1940s there was the establishment of the Export Guarantee Fund. In the 1950s they modernized their terms and regulations. GIEK implemented major organisational and administrative changes in 1980 and was granted wider powers by the ministry. 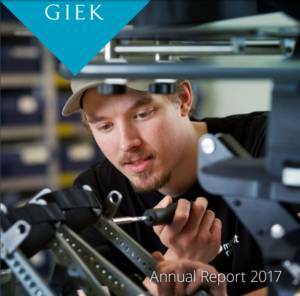 The same year, GIEK’s 31 employees moved to the current premises at Dronning Mauds gate 15, Oslo. The tender guarantee scheme was transferred to GIEK in 1982. In 1987, the exchange rate guarantee scheme was withdrawn and the GIEK Committee was disbanded. A special export guarantee scheme for investments in developing countries was introduced in 1988. December 2015, GIEK moves to Støperigata 1 at Aker Brygge in Oslo. Since January 2015 the ownership of GIEK Kredittforsikring is transferred from GIEK to the Ministry of Trade, Industry and Fisheries. In December 2015, GIEK moved to Støperigata 1, Aker Brygge in Oslo.